Most catalogs sit on my counter for a day or two and then, if unread, turn to recycling material in one determined decluttering swoop. Not so for the latest from Athleta. Confession – even with their mailers, I typically thumb through for that one 20% off any item coupon they send like once a year, and then toss it. But this one, with the Power of She displayed so vividly through models who look like me, with thighs that don’t have a full inch in between, and stomachs that are strong if not six pack buff, this one I’m keeping. Because without posturing or pretense, these 92 pages reinforce one undeniable truth – she is beautiful. Not “she is beautiful for a heavy set/mom bod/out of shape woman” (all qualifiers I’ve heard from others and at times even thought about myself). But beautiful innately, as much as she is strong, and capable, and graceful. After enduring too many episodes of the swimwear dressing room circus, this is an ethos I can get behind. It also speaks to my current situation. I have never been more physically fit in my entire life. Yet, no matter how often I move or how carefully I eat, a flat stomach and jiggle-free thighs remain pure fantasy. And while I’m okay with that, focusing on what my body can do instead of where it falls short, that doesn’t mean I’m going to hide myself in a shapeless swim dress. Or a spandex corset (looking at you, Miracle Suit). But a well-made, modest without being matronly option that keeps the fun in functional? Yes, please. Last year I bought my first, with plenty of weight already shed but much more left to lose. In it, I was nobody’s catalog ideal. 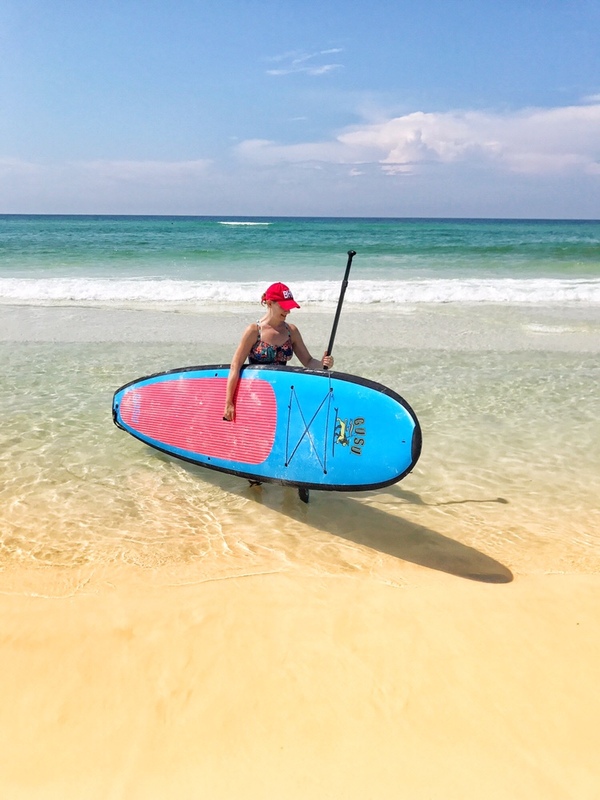 But I also felt confident enough to give paddle boarding a go for the first time, not thinking twice about who might be watching from the shoreline or what they were thinking. This year I’m emboldened. If not a strappy backed two-piece, maybe a long-sleeved SPF responsible top with bikini bottoms. Or both. With heartfelt thanks to Athleta, for challenging the reign of fugly swim frocks, and showing how damn gorgeous the Power of She can actually be. Previous Previous post: Do unto others. Next Next post: Take the vacation.